Ditch those run-of-the-mill pizzas for Oven Story's scrumptious chipotle and el classico cheese pizzas, handcrafted to perfection by Luca Moretti. Oven Story's pizza has won us over with its fulfilling toppings, great choice of gourmet cheeses and fine, freshly-baked base. There are four kinds of cheeses that are used to make these pizzas - peri peri, chipotle, 4 pepper and el classico. 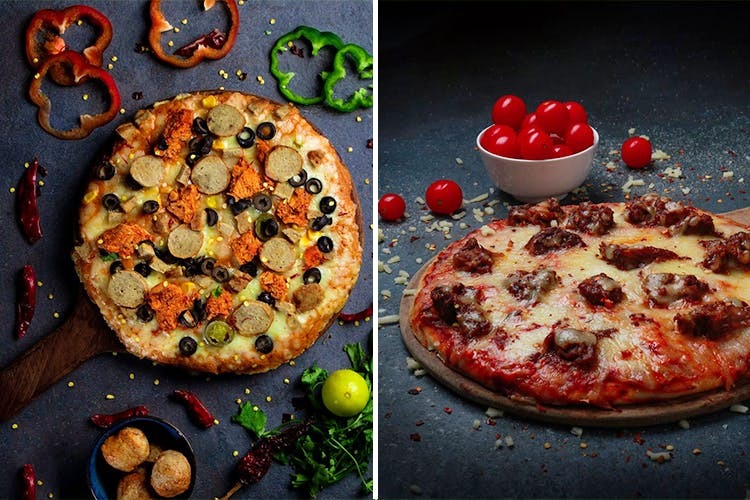 Since we love all things spicy and hot, our personal favourite would be Middle Eastern supreme pizza in fiery peri peri cheese along with falafel, roasted veggies and mushrooms. We also recommend you try the combination of chicken and sausage pizza in chipotle cheese. Works like a dream for us. There are limited options for vegetarian pizzas. We hope they add some more variations with cottage cheese and exotic veggies. While we haven't tried it, but we have definitely heard some rave reviews about Oven Story's crispy garlic bread topped with melted cheese.